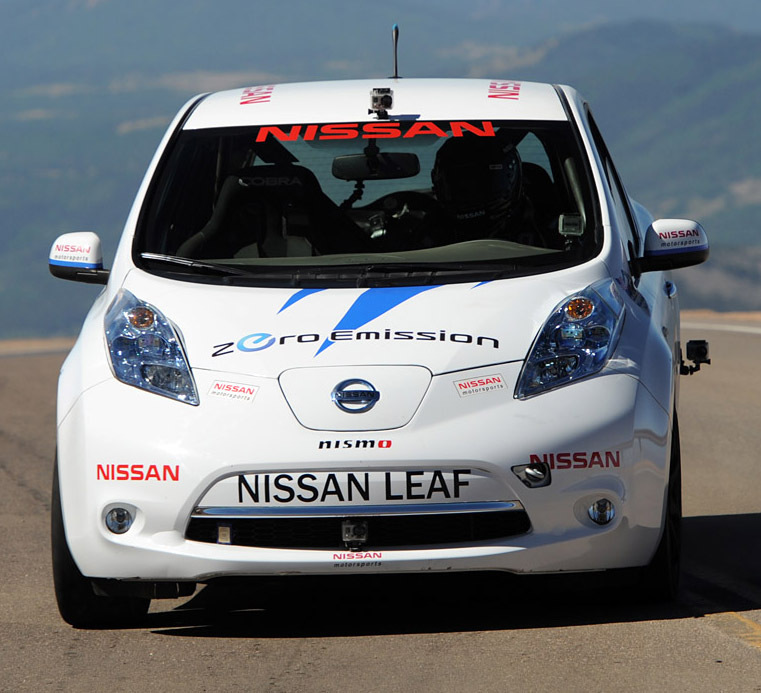 Under beautiful blue skies at the 89th running of the Pikes Peak International Hill Climb yesterday, veteran Nissan off-road truck racing champion Chad Hord and the 100 percent electric Nissan LEAF made history as the first winners of the Electric Production Class. The LEAF completed the run with a time of 14 minutes 33 seconds for the 12.42 mile run. Even though the LEAF was virtually stock except for interior safety modifications and more aggressive wheels and tires, it out ran several competitors with highly modified internal combustion engines. The race is run on a 12.42 mile course with 156 turns that begins at 9,390 feet and finishes at the 14,110 foot summit of Pikes Peak. As the drivers climb toward the summit, the thin air slows reflexes and saps muscle strength. The thin air also robs internal combustion engines of up to 30% of their power at the summit but the LEAF's electric motor is not impacted by the thin air. It produces the same amount of power at the start and the summit. The LEAF zipped from corner to corner in near silence other than the sound of squealing tires and the high pitched sound of a warning beeper installed at the request of the race organizers to warn spectators and workers. The LEAF comes from the factory with a pedestrian warning system that is active up to about 30 miles per hour but since the LEAF was traveling much faster on the course a supplemental system was a good way to warn those along the course that it was approaching. "The LEAF was great fun to drive up the mountain" said Hord. "With the instant torque from the electric motor we were able to jump out of the many slow corners and the performance was very consistent from the bottom to the top since the electric motor wasn't affected by the high altitude near the summit like the gasoline powered cars." Since the competitors can only practice a third of the run at a time during the week leading up to the race, today was the first time Chad and the LEAF had completed the entire race distance in a single run. "The Nissan LEAF and Chad both performed flawlessly this week" said Ron Stukenberg, senior manager, Marketing Communications, Motorsports. "This was an innovative way to demonstrate that 100 percent electric vehicles perform very well in highly demanding situations like the Pikes Peak International Hill Climb." Fresh off his first ever Traxxas TORC series podium finish in his Nissan Frontier last weekend at Crandon International Speedway, Colorado Springs resident Brad Lovell made it two in a row with a second place finish in the tough Pikes Peak Open class in a time of 12 minutes and 33 seconds. This was done in the same truck that finished second at Crandon despite the very different nature of the course at Pikes Peak verses that at Crandon.